The University of Illinois Gamelan Ensemble is designed to study the nature of Balinese gamelan music by exploring its unique characteristics, the character of the various instruments, and the elements of arrangement (central melody, various types of embellishment and elaboration, gong punctuation). It is, essentially, an applied course. Consequently, it will be devoted to learning the music by playing it. 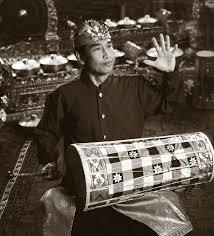 The class will be taught using an oral tradition system called Maguru Panggul, which is the time-honored method of Balinese gamelan music pedagogy. The literal meaning is “teaching [or learning] through the mallet,” so no prior experience reading musical notation is necessary. In the process of becoming conversant with the instruments, their characters and capabilities and some of the traditional Balinese repertoire for the Gamelan, students will also learn about the meaning and place of music in Balinese society, the structures and characteristics of the music that reflect social characteristics in their communities, the rituals the various works are associated with, and a number of other cultural issues surrounding the musical traditional in question. If you are interested in joining, or have questions about participating, please contact I Ketut Gede Asnawa.